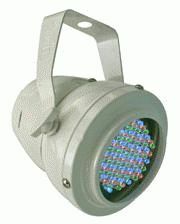 COLORsplash 196 is a 7-channel, linkable DMX-512 can fixture fitted with 196 bright red, green and blue light emitting diodes that produce a high-output, richly colored wash suited for architectural, ambience-setting and entertainment applications. 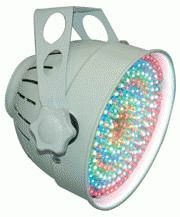 The diodes are distributed in seven individually controlled, concentric circles and they can produce a wide spectrum of colors via RGB mixing. COLORsplash features seven static colors, a color change program with 10 selectable speeds, 5-color pattern chase programs with adjustable speed and sound-active mode via the LED-BOSS optional controller. The lifespan of the diodes (85 red, 51 green, 60 blue) is estimated at up to 100,000 hours. Power is switchable, 115V/230V or 230V.Each unit weighs 4 lbs (1.8kgs) and measures 6in x 8in x 7.5in (152.4 mm x 203.2mm x 190.5mm). 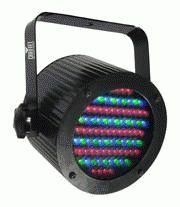 Two other LED cans, the COLORmist and the DMX-512 COLORsplash Jr., housing 80 and 86 LEDs respectively, will also be showcased for the first time at LDI 2005.